I've written many times about bulk buying, and how it is a great money saver. You might think that that means that if you find a source of buying bulk foods, you should definitely do so. But is that so? Is bulk buying always worthwhile? Is it always smart to bulk buy? If you don't have enough money. I've written about how you can bulk buy even if you have no spare cash, with methods on how to build a bulk buying fund. 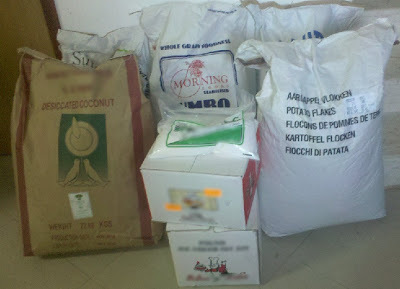 If your bulk fund is not complete, if you don't have extra money set aside to buy bulk food, don't make a bulk order! If you're going into debt to buy bulk, if you are putting your bulk order on a credit card and making payments with interest, you'll almost always be spending more money on interest than you'll be saving, making it a rather unfrugal purchase. Even if you've set aside money in an account for such a purchase, even if you won't need to borrow money in order to bulk buy, there still are times that its better off to not buy bulk. For example, the last time I made a bulk purchase, it was a pretty stupid move and hurt us financially, because even though we had enough money for that purchase then, it was only a short while before the summer, and my husband gets paid hourly and didn't have much work this summer... So we had a nice cushion of money, and then used it up right before we had a really minimal income for two months. Major fail there! Lets just say recovering from that stupid mistake has been taking a long time and we're still not fully over it. If you're approaching a time in which you know your expenses will be greater or your income less, better leave the money in the bank and spend more on food than tie up lots of money in food and have hundreds of pounds of food in your house but no money in the bank with which to pay your bills. This also would apply if your job situation is precarious and there's a good chance you or your spouse may be out of work in the near future, even if nothing is guaranteed. Keep that money in the bank as a backup, because you can't pay your bills with 50 pounds of flour. Even if something is cheaper to buy in bulk than retail, if its not significantly cheaper, in my opinion, it's not worth buying bulk, as you're laying out a lot of money in one go that you might otherwise be able to spend on something else that will save you even more money. Certain items are expensive and in order to be truly frugal, should be used sparingly. Chocolate chips are one example. I found them being sold in bulk for ¼ of the price that they're generally sold for in the grocery store, and bought 20 pounds because it was such a terrific deal. Those 20 pounds of chocolate chips finished very, very quickly. I spent much more money on chocolate chips in that short amount of time than I usually do; even if the chips themselves were cheaper, I ended up wasting money, not saving. Unless you have superb self control, its better to not bulk buy luxury items, because they very likely would get used up much more quickly than they would have been had you purchased them in smaller quantities at a higher price. Bulk buying with food sensitivities. I guess my only suggestion is- if there is a chance that you are sensitive to certain foods, if you have any health issues that you might at one point in the near future try to mend by changing your diet, it may be smart to refrain from buying large quantities of any foods. Also, don't buy a ton of one food that you don't currently already eat a lot of, because even if you do sometimes eat a food without problem, overloading on that food can make you react. Coconut was one example of that. A little bit here and there didn't affect me, but once I was trying to use the 50 pounds that I had sitting in my house, I started overloading on it and began reacting to it. Only buy bulk foods of things you already eat. Often when making a move, you have to pay per box or by weight, especially if making a long distance move. If there is any chance that you won't be staying in the same area for the next little while, it might not be a good idea to stock up and bulk buy if it'll mean needing to transport those huge amounts of food with you on your move. Other than that, bulk buying usually IS a good idea, and it is one that I suggest most people implement in their lives. Yes, even if they have a teeny tiny apartment with no storage space. I bulk buy in my 484 square foot apartment with no built in storage space (not even closets!). Do you ever bulk buy? Have you ever made a bulk purchase when doing so was not a good idea? Have you ever regretted a bulk purchase? What was it and why did you regret it? Do you have any suggestions either to me or to my readers how to avoid falling into the trap I fell into- buying 25-50 pounds of a few types of food and only discovering after that you can no longer eat that food and have so much food sitting unused in your house, like my vital wheat gluten, coconut, and powdered milk? When do you think it is a bad idea to bulk buy? I've been bulk buying for awhile now, but my husband and I are thinking about downsizing our home. Where do you store your bulk items while living in such a small space? You shouldnt bulk buy out of season either. I dont bake in the summer much at all, so why bulk buy baking goods?